Gazelle The Horn > How-To's > Sell Your iPhone > How do I unlock my phone from my carrier? If you’ve decided it’s time to unlock your iPhone or Android phone, you have come to the right place. If you read our previous post on why you should unlock, you know you can grab some extra cash when you trade in. To find out how to unlock your device, we’ve compiled information for all four major carriers all in one place. Carriers will post on their websites clear and accessible information about how to unlock devices. Upon request, carriers will unlock devices for consumers who have completed their contracts. Carriers will either notify consumers when their devices are eligible or automatically unlock them. The process for unlocking devices will be initiated, if not completed, within two business days of an eligible request. Military personnel deployed overseas will be able to unlock their devices. Carriers have agreed to implement three of the policies within three months and the rest within a year. Many carriers have eligibility requirements you must meet before you can unlock, so make sure you read all the details first on their website. You can also contact a customer care representative from your carrier for any questions regarding unlocking your phone and your eligibility. IMEI (serial number) of your device. The IMEI can be found by dialing *#06# OR by going to Settings > General > About. In the event your device can’t power on, this number can also be found on the original box, under the battery, or back of the device. Once you have that information you should be ready to complete the AT&T Device Unlock Form. The unlock process can take up to 5 days and you can check the status of your request at the AT&T Device Unlock Request Status website. Your device was designed for use on AT&T’s network. Your device wasn’t reported lost or stolen. Current customers are allowed up to five device unlocks per account, per year. Former customers are allowed a total of five device unlocks per former account. Full details and eligibility requirements on unlocking your AT&T device can be found on the AT&T support page. A majority of the smartphones offered by Verizon Wireless work on both CDMA and GSM networks. Verizon has done this so that customers have an easier time when traveling abroad. Most carriers outside the United States use GSM technology, similar to AT&T and T-Mobile. Unlike AT&T, Verizon does not currently offer an online solution for an unlock request. Verizon customers will need to call 1-800-711-8300 (Verizon Global Support) and ask the representative for a SIM unlock. There is also good news for many Verizon customers when it comes to unlocking. The majority of Verizon phones that support GSM technology (have a SIM card slot) and are 4G LTE capable already and come factory unlocked from the carrier! The complete list of global ready devices can be found at Verizon, but it includes many popular handsets like the iPhone 5S, HTC One Max, Galaxy Note 3 and Motorola X. Customers that own non 4G capable devices that support SIM cards, will need to submit a device unlock request. T-Mobile customers must contact customer care in order to get their device unlocked by dialing 611 from their handset, or by calling them at 1-877-746-0909. Before you make the call you will want to have all the necessary information in front of you so you do not have to call back. 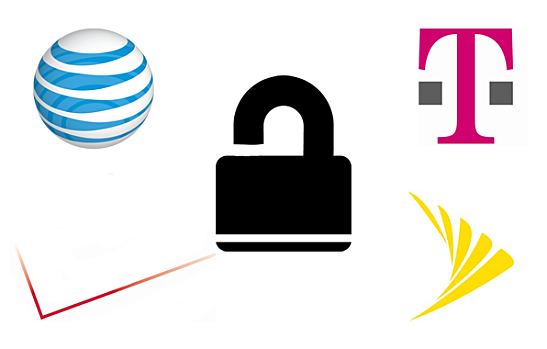 Like AT&T, T-Mobile has also set in place various requirements in order to complete your unlock request. Being a T-Mobile customer, I can tell you first hand I had no trouble unlocking. Last but not least we have Sprint, the nation’s third biggest carrier. Sprint is probably the least friendly when it comes to unlocking as they have no online form available and their devices come completely locked. Just like Verizon, Sprint phones primarily operate on CDMA technology, rather than GSM found on AT&T and T-Mobile. Sprint does have many global roaming devices, which include SIM card slots when traveling abroad. If you own one of these devices and wish to get it unlocked, here is exactly what to do. Sprint also has some requirements in order get your device unlocked. The carrier requires the account to be active at least for 90 days and in good standing order to be eligible for an unlock code. If your account is in good standing and you meet the requirements, Sprint should unlock your device in as little as 5 days. What is a locked phone and why do carriers lock them? I currently reside in Uganda. and my phone is attached to a mobile carrier called airtel uganda. what are the instructions I should follow to unlock my phone?